How You Can Benefit From Using a Ductless System | Comfort First Heating and Cooling, Inc.
A ductless mini split doesn’t use ducts. Shocker, we know. Instead, it uses smaller air handlers to condition individual rooms in the home. Typically, these are the more “important” rooms like the living room, master bedroom, and dining room. Each air handler has its own thermostat, and can operate semi-autonomously from the rest of the system. If you want to change the temperature in your part of the house without bothering anyone elsewhere in the house, this might be the perfect system for you. Ductless systems are also heat pumps, which means they offer both heating and cooling functions on-demand. This is one of the greatest advantages the ductless system offers, since people like to use a single system year-round instead of the more traditional (and more expensive) two system configuration. Ductless systems can save a lot of money on energy costs, too. A normal heat pump or air conditioner must condition the entire home, or none of it. This wastes a lot of energy on parts of the home which are not even being used. With a ductless system, though, that’s not a problem. Just turn on the system in the areas where you can benefit from it, and leave it off in rooms that no one is in. Of course, there are certain considerations to be made when thinking about installing a new ductless system. For one thing, most homes are not already set up for making use of these kinds of systems. That means that you’re going to need to have some construction work done in addition to installing the system itself. 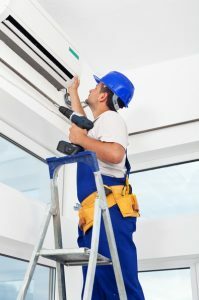 For another, while ductless systems are quite good at covering most of the home, the nature of the various air handlers means there’s going to be some parts of the home that likely will experience hot or cold spots. Still, many homeowners feel these issues are worth it for the many advantages that they garner in return. Comfort First Heating and Cooling, Inc. provides a full range of air conditioning services in Orland Park, LI. If you are looking for a new air conditioning system for your home, contact us today to schedule an appointment. We’ll make sure that you get the best air conditioning system to meet your home’s specific needs.